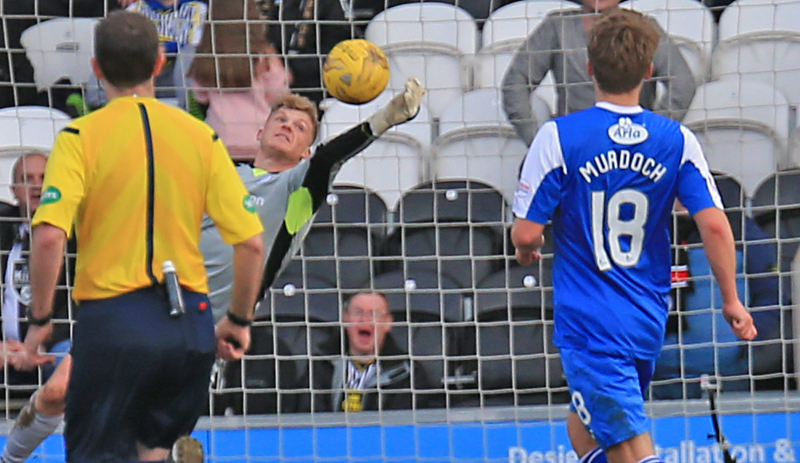 Queens were left to rue their first-half chances as they went down 2-1 at St Mirren. After a promising start for the visitors, the hosts took an undeserved lead from a Stevie Mallan penalty. Gary Oliver levelled in the second half but 90 seconds later an unfortunate own goal from Callum Tapping proved to be the difference at the Paisley 2021 stadium. The Doonhamers made five changes from last Tuesday`s defeat. Derek Lyle, Kyle Jacobs, Andrew Murdoch, Alex Harris and Gary Oliver returned to the starting line-up for a must-win fixture to keep Queens` play-off hopes alive. Queens lined up in 4-4-2 formation with Murdoch and Harris on the flanks, Jacobs slotting into centre midfield alongside Callum Tapping and Gary Oliver partnering Lyle up front. With the match only four minutes old, the visitors were forced into an early substitution, Jordan Marshall pulled up with an upper leg strain after passing the ball and immediately signalled to the bench that his game was over and needed to come off. 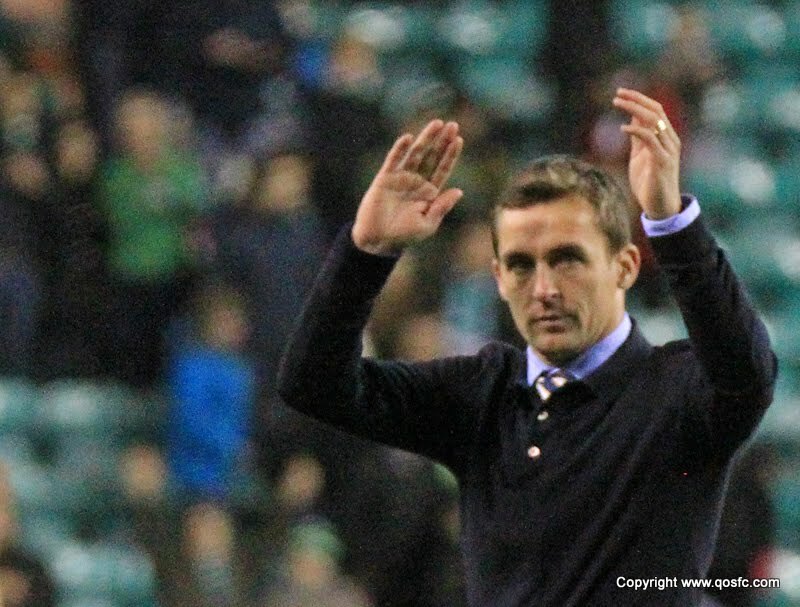 Darren Brownlie replaced Marshall and was placed into the heart of the defence meaning captain Chris Higgins shifting to left-back position. Even with an early injury blow, James Fowler`s men started the match positively and had the first attempt at goal in the 7th minute. On-loan Rangers midfielder Murdoch got on to the end of a defensive header from Andy Webster, and played in the overlapping Lewis Kidd, who lobbed Buddies goalkeeper Jamie Langfield from 20-yards out only for his cute effort to hit the side netting. The visitors were having the better of possession and were the only side looking likely to grabbing an early lead and were inches away from taking the lead after ten minutes of play. After Oliver was brought down inside the Buddies half, Harris floated his free-kick onto Lyle`s head in the centre of the penalty but his header drifted wide. Queens continued to push and were nearly rewarded when after a cute lay-off from Oliver, Harris turned his marker and cut inside onto his right foot before curling an effort over the bar from 18-yards out. The home support were beginning to vent their frustration at their side?s slow start and they were nearly behind in the 22nd minute. Harris swung in a corner and Brownlie met it but was caught by Langfield who had been the only goalkeeper tested so far. Seconds later, The Doonhamers were on the attack again, this time Tapping found Jacobs just outside the box and the South African scooped a cross-come-shoot over the advancing Langfield, clipping the woodwork then cleared to safety by Gary Irvine. Queens were dominating the proceedings and all was missing was the all-important opener and it nearly came through top goal scorer Derek Lyle. Kidd flew a ball over the top of the nervy Buddies defence, Lyle fired a 20-yard volley straight down Langfield`s throat. Brownlie chasing the cause made contact with the striker and referee Alan Muir pointed to the spot. Stephen Mallan, who scored the only goal last time we played in Paisley, stepped up and made sure he was on the scoresheet slamming his penalty into the bottom right hand corner of the net despite Robbie Thomson diving the right way. It was harsh on Queens as they had been the only side who were looking dangerous in the final third and the hosts not having a shot at goal until the penalty. Queens almost hit back immediately, Harris got back up the pitch from the kick-off but this time cut onto his left foot and saw his shot fall straight at the feet of Langfield. The away side continued to cause havoc in the Saints back-line as Oliver managed to hold off Irvine and put a deep cross onto the head of Lyle who placed his header to Jacobs who couldn`t quite get enough contact onto the lay-off. James Fowler had a worried look on his face when Lewis Kidd went down and signalled for some medical attention. The right-back managed to get back on his feet after a few minutes of treatment and limp back on to the field to re-join the Queens back four. The delay in play gave the hosts a new lease of life, after a great run from Calum Gallagher he was brought down by Tapping and was the first name in referee Alan Muir`s book in the 42nd minute. Mallan lined up to take the free-kick from 25-yards out in a similar position where the midfielder scored from last month, but there was to be no de-ja-vu for The Buddies as Mallan dragged his free-kick wide of Thomson`s right-hand post. On the stroke of half-time Queens nearly drew level. Oliver forced a corner out of Irvine, Harris whipped the corner-kick in and after a miscommunication between goalkeeper and Clarkson the ball fell to Jacobs who headed the ball back into the six-yard box and was met by Brownlie but his looping goal bound effort was nodded off the line by Shankland. Brownlie`s chance was to be the last action of the first-half and Queens would feel hard done by going into the interval a goal down after a promising attacking performance. James Fowler was forced to make another change at half-time, Iain Russell replaced Kidd who was still struggling with the injured he picked up in the first period. The substitution moved Kyle Jacobs to right-back, Murdoch shifted to centre-mid, Harris to the right-hand side of midfield and Russell to his preferred left winger role. 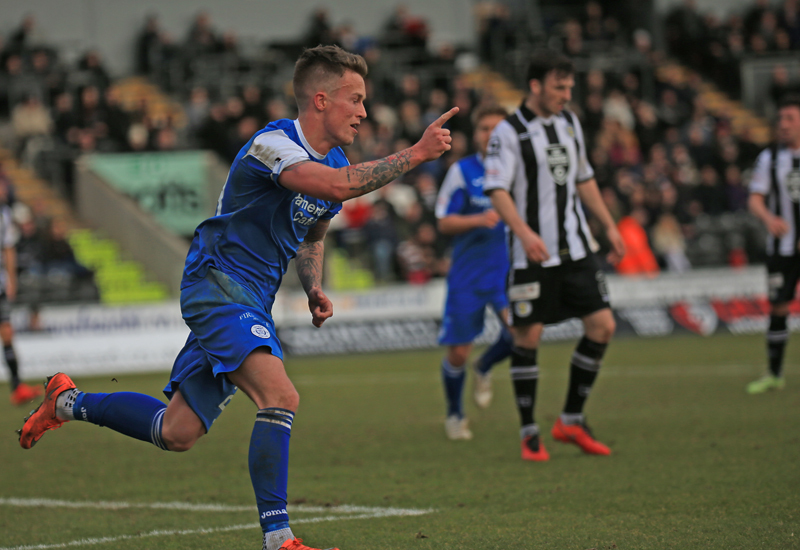 The second-half was only four minutes old and another opportunity fell to the Doonhamers to get back on level terms. Oliver beat his marker but forced himself out towards the right hand side of the Saints penalty box, seen the run of the advancing Harris, played the ball through to the on-loan winger but his cut-back was cleared by Keith Watson. The home side made their first change of the afternoon in the 53rd minute, David Clarkson`s quiet afternoon came to an end to make way for Alan Gow. The substitute was immediately involved as his lay-off found Gallagher but he fired his long range over the bar. The introduction of Gow certainly seemed to lift Alex Rae`s side and they thought they had doubled their lead on the hour mark. Gow fed in Mallan who then picked out Gallagher and his deflected shot was poked home by Shankland. The majority of the 3888 in the Paisley 2021 Stadium were celebrating the goal but referee Alan Muir and his assistants eventually ruled out the goal deeming Shankland to have been in an offside position. A few minutes later The Doonhamers finally got a deserved equaliser. Jacobs drilled in a terrific cross from the right-hand side, dropped perfectly into the path of Gary Oliver who nodded home from six-yards for his third goal in a Queens shirt to the delight of the 203 travelling fans. But within 90 seconds the hosts regained their goal advantage thanks to an own goal from Callum Tapping. Alex Cooper and Jordan Stewart linked up well on the left and when the ball was eventually cut back into the box the unfortunate Tapping turned it into his own net. Russell sprayed a lovely ball to Harris on the right-hand-side but his inviting cross was headed wide by Lyle. The visitors were throwing everything at the Buddies defence but couldn`t find the final ball to get the game on level terms. It was hosts who nearly doubled their lead with only minutes left on the clock, Shankland`s cross found Gow who volleyed a thunderous effort that Robbie Thomson saved in spectacular fashion. 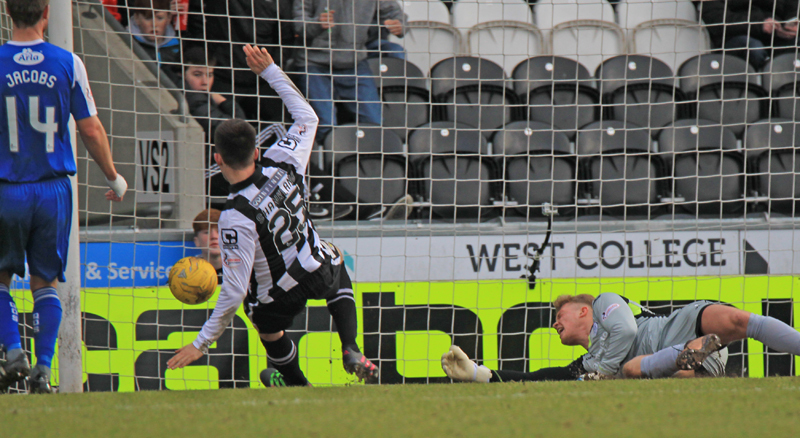 Thomson`s wonder-save was the last of the action as Alan Muir blew for the full-time whistle. 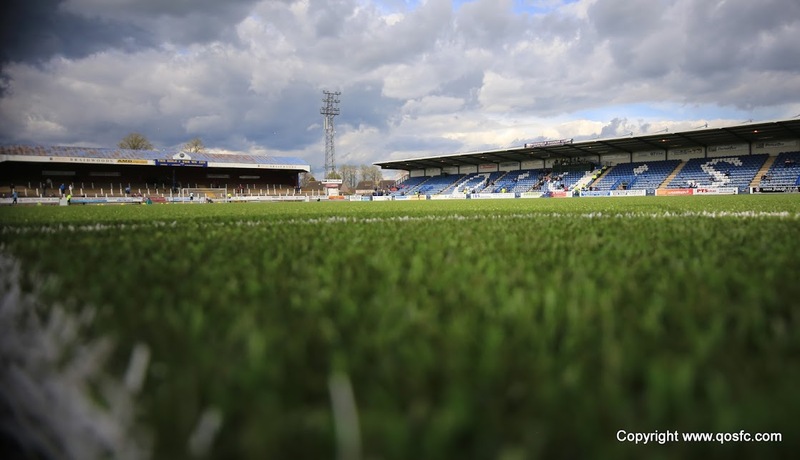 It was a disappointing result after a good performance and on any other given day Queens would have returned to Palmerston Park with at least a point. The games keep coming thick and fast with our next match being played on Tuesday night at Greenock Morton. 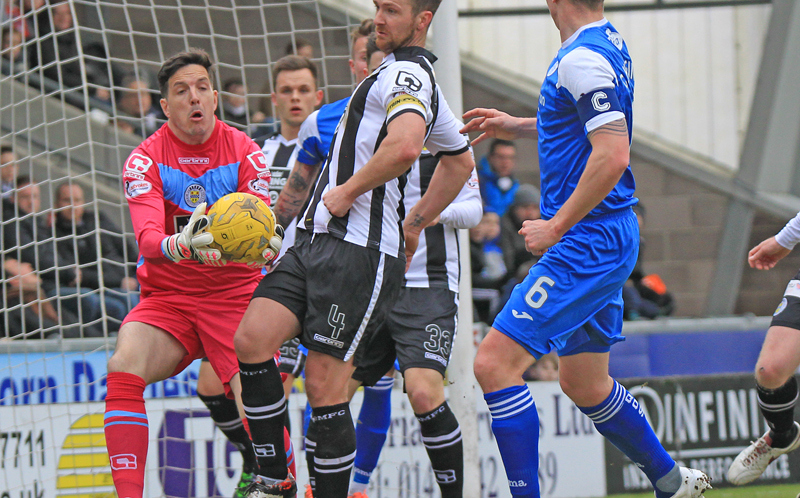 14:10 Saints; Langfield, Irvine, Watson, Gallagher, Agnew, Mallan, Clarkson, Stewart, Shankland, Cooper. 14:28 Queens make five changes to Tuesday night`s defeat. Harris, Lyle, Jacobs, Murdoch and Oliver come in to the starting eleven. 15 min Harris floats a free-kick in to the box, Lyle meets it but his header drifts wide. 24 min Jacobs` cross-come-shot has Langfield scrambling back to his line and to the keeper relief it clips the bar. 29 min Penalty to St Mirren. 37 min Brownlie brings down Shankland and the referee points to the spot. Mallan steps up and slams home to give the hosts the lead. Half Time Russell replaces Kidd before the second half kick-offs. 60 min Shankland shot looks to have given the hosts a 2-0 lead but the assistant referee raises his flag for offside still 1-0 here. 62 min Harris deep cross beats Irvine and Oliver nods home to equalise 1-1. 71 min Harris hits a deep cross into the box, Russell heads his effort into the side netting. 85 min Lyle finds space in the box but his header is over the bar.